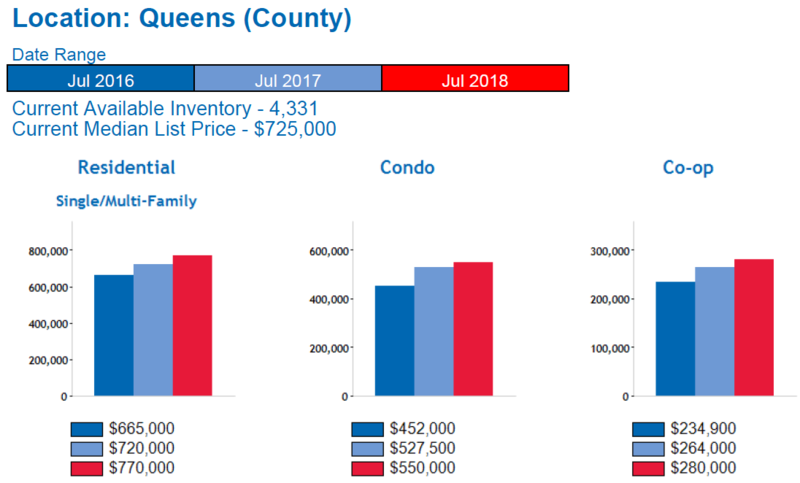 Queens Real Estate Market Report August 2018, provided by the Queens Home Team at Keller Williams Realty Landmark II. Need help? Feel free to Contact Us anytime. We have officially begun the second half of the year and the story has remained the same for most of 2018. In July, home sales remained pretty flat compared to June sales. Residential home sales and condo sales were both up, while coop sales took a dip in July. Overall, sales were up slightly year over year, but for most of 2018 we’ve seen a slight decrease in year over year sales. 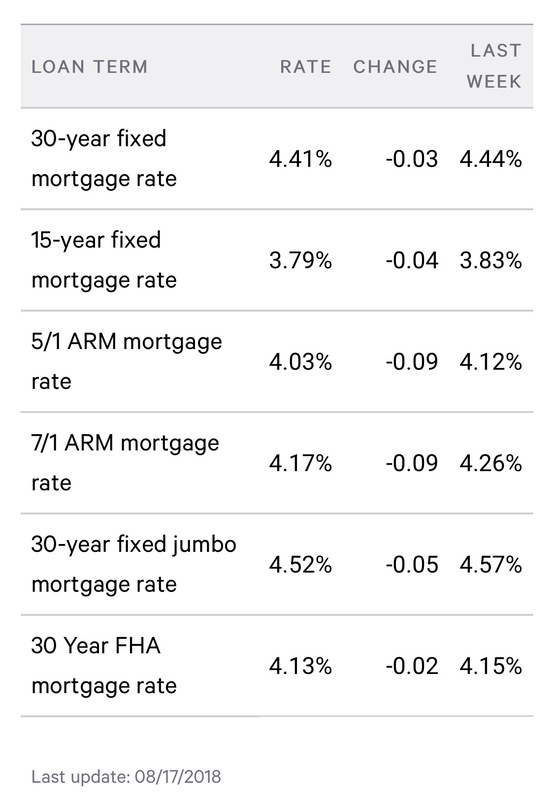 While we usually attribute this to low inventory, this year we believe that it is due more in large part to the higher interest rates which may have taken some buyers out of the market. Still, sales are pretty similar to the sales figures we saw in 2017, and even when they are lower, they are just slightly lower. As for Home prices, July saw another increase in month over month prices, and year over year prices were up once again as well. Although sales have dipped and rates have risen, prices seem to be holding a steady upward trend. The difference we’re seeing this year is that the price increases aren’t as dramatic as the prior 2-3 years. This year it feels like we’re seeing a more “natural” and healthy appreciation for homes. This is good in our opinion, and as long as rates increase in a modest and steady way, then it should not have any drastic impact on our local market. Regarding available inventory on the market in Queens, July saw another increase in # of homes for sale. This marks the 6th consecutive month of inventory increases. To put that into perspective, in January 2018 we had 3,404 homes for sale in Queens, and right now we have a total of 4,331 homes for sale, that’s almost 1,000 more properties for sale. As for Month’s Supply (the indicator of whether a market is favoring buyers or sellers), currently we have a 6.5 month supply of homes in Queens. Month’s supply below 6 months is said to favor sellers, while month’s supply over 6 months is said to favor buyers. Month’s supply of 6-7 months is said to be a “balanced market”. So, at this time the Queens real estate market would be classified as a balanced market. then the absorption rate is 10/100 = 10%. Being that closed sales are a lagging indicator, we calculate Absorption Rates using pending sales from the previous month and this gives us better insight as to where the market is right now. The Long Island Board of Realtors reported Queens home sales at a rate of approximately 744 homes during the month of July. This was an increase of .001 percent from June and an increase of 2.3 percent from July of last year. Specifically, our Queens real estate market report August 2018 shows that Residential home sales were UP 4.3%, Queens Condo sales were UP 8%, and Queens Coop sales were DOWN 3.2% compared to July of last year. Over the last 12 months, Queens home sales are DOWN 1.1%. The median home price in Queens rose to $587,194 in July, this is an increase of 3.5 percent from June, and an increase of 10.8 percent compared to July of last year. The median home price has increased by approximately $57,000 since last year. 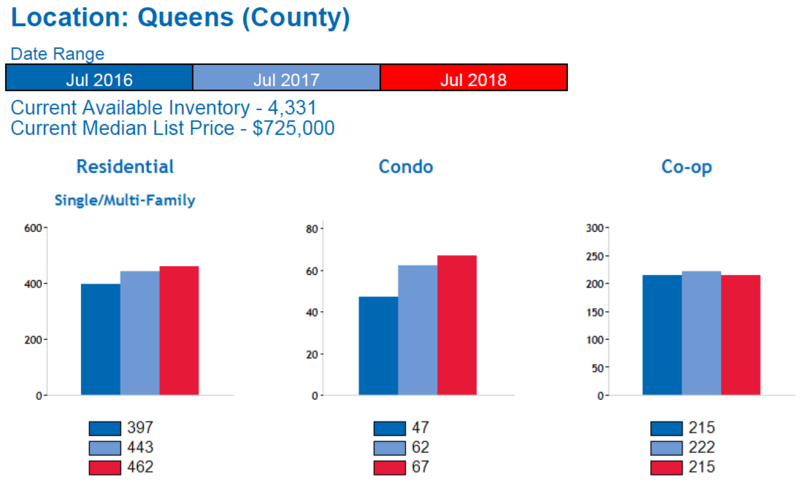 Specifically, our Queens real estate market report August 2018 shows that Queens residential home prices are UP 6.9%, Queens Condo prices are UP 4.3%, and Queens Coop prices are UP 6.1% compared to July of last year. Over the last 6 months, the median home price in Queens is up 12.1%. There is currently a 6.5-month supply of housing inventory in Queens, this is up from the 6.4-month supply we had in June, and up from the 5.9 month supply we had in August of last year. This year we have actually seen Month’s Supply rise every month since January. To put that into perspective, in January of this year, we had 4.5 months supply of inventory and right now we have 6.5. There are currently 4,331 homes for sale in Queens. This is an increase of 2.8 percent compared to last month, and an increase of 9.9% compared to August of last year when there were 3,941 homes for sale in Queens.